Kerala Pilgrimage Centres pictures the secular co-existence and religious harmony. There are several pilgrimage destinations all over Kerala. Experience an enigmatic cleansing process in the presence of the divine and come back with a calm and balanced state of mind, ready to tackle everyday pressures. Feel the spirit of goodness, happiness and the joy of life percolate into you during your tours to the pilgrimage destinations located in Kerala, South India. The Temple at Sabarimala is one of most visited in entire India. This is despite the fact that the temple is open for public during specific season only (November 15 - January 19). It is located at a height of 950 m on the Sahayadri range amidst forest areas. The temple is surrounded by 18 hills, each with a temple. Today, remnants of these temples are visible from the Sabarimala temple. The uniqueness of this temple lies in the fact that people of almost all religion and faith can pay a visit to it without any discrimination, however, women are not allowed in. The reason given for this is that Lord Ayyappa, to whom the temple is dedicated, was a confirmed bachelor and hence women (who have attained puberty) should not visit him. Guruvayur is one of most revered pilgrim destination for people of South India, so much so that it has been termed the Dwarka of South. People from far off come in large numbers just to have a glimpse of the deity despite knowing the fact that they will have to wait for long hours and the darshan itself will be very short. 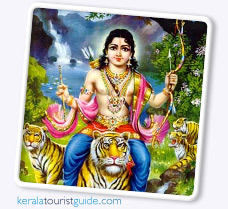 The temple town of Guruvayur is located in the district of Thrissur in the state of Kerala. This is a famous pilgrimage destination for the Christians and is located at a distance of 52 km from Kochi. It stands on the side of the Periyar River atop a hill known by the name of Malayatoor. A church was established in 900 AD. Pilgrims can reach here on on foot. Agastyakudam or Agastya Malai, is a huge peak in the Western Ghats at a height of 1868 m. This mountain forms part of the Kollam and Thiruvanantpuram district of Kerala and Tirunalveli and Kanayakumari district of Tamil Nadu. The range is known as the abode of famous Hindu saint, St Agastya and is therefore a popular pilgrim destination for Hindus. For devotees visiting the hill, there is a life size statue of the saint at the top which can be worshipped. The hill range is also rich in medicinal plants and herbs. Varkala lies in the Thiruvanantpuram district of Kerala and is famous for 2000 year old Janardhan Swamy Temple by the sea. The temple is dedicated to Vishnu. The legend behind the temple is relates a story when once Vishnu got overtly fascinated by the singing of Narada and thus followed him to the abode of Brahma. Narada was not aware of Vishnu's presence but when he reached Brahma, the latter immediately noticed Vishnu. In respect, he stood up and bowed. However, by this time Vishnu had vanished and the holy mendicants were laughing at the foolishness of Brahma. Enraged, Brahma sent them to earth. The mendicants prayed for mercy and in response Narada threw his valakalam to mark the spot where they were to perform their penance. Vishnu too blessed the land with a pond, Chakratirtham which till today occupy a place in close vicinity of the temple. A holy dip in the sea water here is considered extremely auspicious as it is believed to take away all the sins. Hence the name of the beach, Papnasham. A natural spring, Padmatertham is supposed to have curative properties. The temples at both these places were established by Narayan Guru, a famous sage and reformer of India who belonged to the middle rung class (which had to bear the brunt of social injustices of the time). In one of his wanderings in the year 1888, he came upon Aruvippuram where the local people requested him to build them a temple. Guru Narayana selected a stone from the nearby river bank and supposing it as the idol of the temple, consecrated it. The Brahmins were enraged at his moves as he did not belong to their caste. Nonetheless, Guru Narayana did not pay any heed to their objections and commanded to place a plaque in the temple with inscription that indicated that the place was devoid of dividing walls, caste or race and hatred of rival faith. Around 1904, the saint decided to settle down at a place known as Sivagiri and began his worship of Amba. Both these places command immense respect from devotees all over the world. Since 1896, the Marmon convention draws a large number of Christians from far off on the banks of river Pamba. The convention is organized by the Mar Thoma Evangelistic Association and continues for seven days in the month of February. The Mar Thoma Evangelistic Wing is a missionary wing of the Mar Thoma Church located at the banks of river Pamba. Thousands of Christians throng this convention to hear what the reputed speakers from world over have to say about their culture and religion. This is yet another religious convention, albeit a Hindu one, that has the banks of river Pamba as its venue. The convention is held at Cherukole in the month of February and sees a number of renowned speakers attending it. This is a famous Muslim festival held at the Jama Al Mosque of Pathanamthitta. A number of Muslims come to this mosque in the month of February to be a part of the Chanadankudam Festival and the feast. Beautifully decorated elephants and sounds of Musical instruments leave a lasting impression on the pilgrims. The temples of Kerala, known for their ingenious architecture and simplicity are frequently visited by tourists. The most famous and most often frequented Sastha pilgrimage, the Sabarimala temple is dedicated to the Lord Ayyappa and is open to all religions. Notably women above ten years and below fifty years of age are forbidden to enter the Sabarimala temple.